The word liath (or lia) means “grey” – neither black nor white. 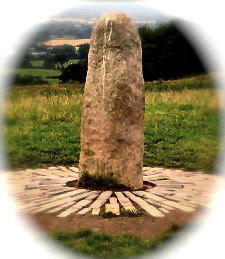 Another meaning of lia is "stone", more usually a special stone, used to mark a meeting place, threshold or boundary. One famous Liath is the Liath Fail which stands in Tara, Co. Meath. According to legend, the Stone of Destiny, or Liath Fail, is the sacred stone on which Jacob rested his head. The guardians of the Stone moved it from Egypt to Sicily and then to Spain before finally bringing it to Ireland. Irish myth credits the Tuatha De Danaan with the securing of the stone during this time, and it was used as the crowning place of the High Kings of Ireland. When you embark on training in a new therapy you have to leave aside "black and white" thinking. You reach a threshold in which new understanding and insight make changes to your professional and personal life. The ancient schools of healing in Ireland (referred to as Liag) died out in the 1950s. We felt the concepts of healing, learning, gathering in one place and the onset of new beginnings were effectively covered by one simple word - Liath. Our philosophy is to provide the highest quality training to our students to ensure they are equipped with the skills to run a busy and successful practice.